I get a lot of questions about how to antique furniture. It’s a really simple process. Once the furniture is painted I use Caromal Colours Toner to age or antique the paint. I gave this dresser a two-tone antiqued finish using the toner. The vintage dresser with mirror is a beauty now. How about those legs and the curvy details. She sure wasn’t a beauty when I found her. I bought the vintage dresser at my favorite junk shop. You guys would be so jealous of the junk shop. It’s my favorite shopping place. The vintage junk and the awesome prices keep me going back. The one positive about the dresser is it had all the original hardware. Older furniture pieces sometimes have missing hardware or yukky replacement hardware. In these instances I can either find hardware to match the original missing hardware or update the furniture with new hardware. The two options……modern knobs vs original knobs…. make for two totally different looks. 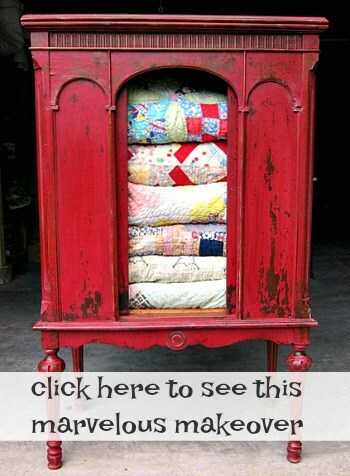 For this vintage dresser I wanted to stay with the vintage look….not modern. The original mirror was in good shape! I’m pretty sure that is the original glass too. The details are so pretty. They don’t make furniture like that anymore. The paint I chose for the project is Beyond Paint in off-white. This paint is easy to work with and doesn’t require priming or sealing. I cleaned the dresser really well and started painting. Two coats of paint did the trick. The paint dries really fast and I was able to apply the second coat of paint just after finishing the first coat…starting with the areas I painted first. It’s pretty easy to finish a paint project in one day. Painting furniture isn’t nearly as hard as people think. I used Caromal Colours Toner very lightly on the body and heavier on the drawer fronts and the mirror. The toner is used to age or antique the paint. I brush the toner on and wipe it off with a dry or damp rag until I get the perfect look. The toner is water based and really easy to work with. The antiqued finish doesn’t require sealing or waxing either. Unlike glaze the Caromal Colours Toner will not wash off. I’ve heard people complain about cabinets painted and glazed because the glaze washes off. 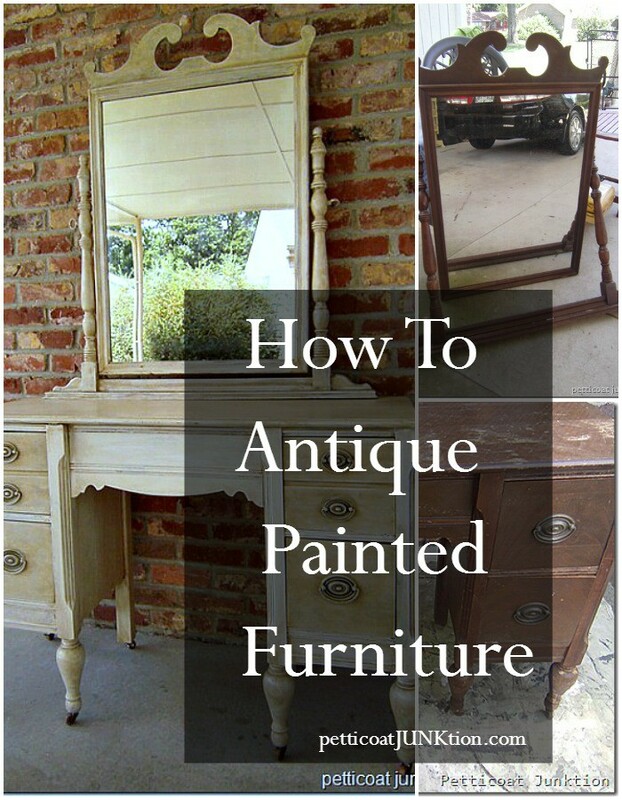 I have a complete tutorial on how to use the toner here… How to Antique Painted Furniture. 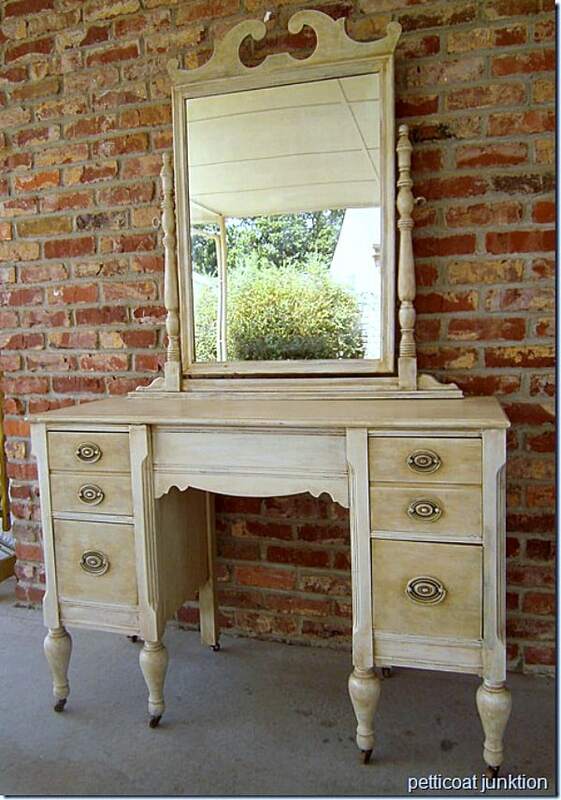 The contrast of the antiqued drawers and the body of the dresser makes this piece a stand out. What a difference from the original look. This is one of my favorite makeovers. What do you think about the toner and the two tone finish for the dresser? I don’t think the dresser would have been such a standout without the contrast on the drawers. This project first appeared on Petticoat Junktion in August of 2011. It has been updated with new details and photos. Thanks for all the wonderful furniture and decor you bring to us. You are wonderful. Kathy, wow do I love this one, your technique really brings out the gorgeous details of this piece! I love your work, it is art. I was laid off three years ago this spring after 20 years so I know what you went through but their loss was your gain. I have just recently started channeling my despair and loss into restoring pieces of furniture and each piece brings me joy. I will never be the artist you are but the pride is there. Thankyou for taking the time for tutorials and for sharing your beautiful pieces. You made my day Kathy. It is hard when something happens to change our routine and lifestyle. I’m glad you started restoring furniture. I think that’s great. I don’t consider myself a restorer (is that a word?). Restoring an antique is much harder than slapping on some paint. Good for you Kathy. I have the same question as Maureen above about how to protect the furniture. Is wax or poly needed? You do beautiful work. Thank you for sharing, it really is inspiring. I’d love to be able to paint something and it turn out so beautiful. Hi there… quick question. Do you have to use a wax or poly with the CC toner. I bought some after watching your tutorial on a chair, but not sure what to do after it’s applied. Thanks for your help! Wow! This piece is just gorgeous! 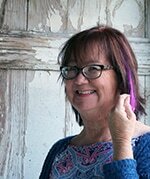 I would love for you to pop over and link up at my party this weekend! oh i love that! it looks like a restoration hardware piece! Furniture with the glass is magnificent, Now a days this type of furniture is very much popular in market. Also stone pieces is very beautiful. Oh, it looks perfectly vintaged now! Great job! Oh my goodness it turned out beautifully! Umm when can you bring it over, giggle,.I hopped over from the feathered nest hop and so happy I did. Hugs! Lovely transformation. You did a really good job with it!